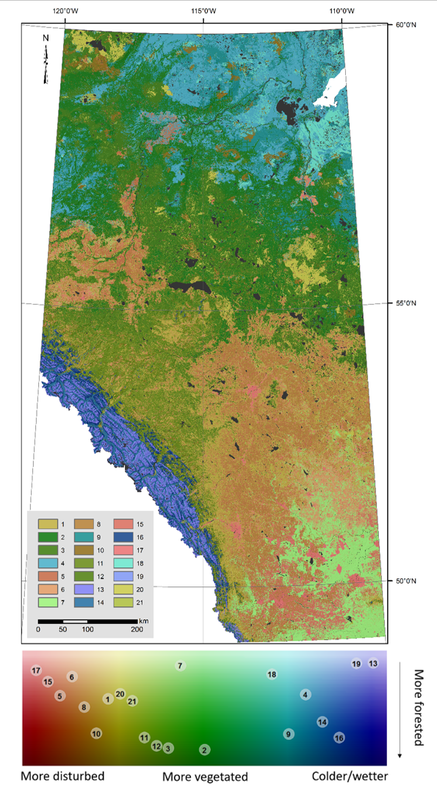 In the first year of the Grizzly-PAW project, Sean has been working to produce a regionalization of Alberta that characterizes unique areas based on their ecological conditions and disturbance history. The approach uses a two-stage clustering algorithm, driven by remote sensing data representing climate, terrain, vegetation, disturbance and human activity. The resulting regions are called “EcoAnthromes”. Most ecological regionalizations are derived from only climate, terrain and/or vegetation and represent the ecological potential of an area. The EcoAnthromes also capture changes in vegetation over time using satellite time-series data, human access via linear features and infrastructure development from nighttime lights detected by satellites. This results in a regionalization that better represents current ecological conditions compared to existing regionalizations. This is an important distinction in areas such as the Yellowhead, AB where changes can be large and frequent as a result of natural disturbance (e.g., fires, insect outbreaks) and anthropogenic activity (e.g., forest harvesting, mining, oil and gas development). Sean presented the EcoAnthromes regionalization at the Canadian Society of Ecology and Evolution Conference in Guelph, ON in July 2018 and this work has been submitted for publication in an academic journal (currently under review). The EcoAnthromes are now being tested in grizzly bear movement and habitat selection models with the expectation that they will better explain landscape patterns and improve our ability to model bear response to changes in snow pack and vegetation. Figure: EcoAnthromes of Alberta, as separated into 21 unique clusters. Clusters are colored to represent relative levels of disturbance (red), vegetation (green), coldness/wetness (blue) and forestation (saturation). The two-stage clustering method provides flexibility and validation metrics to produce regionalizations with different numbers of clusters, depending on the application. Here we have produced 21 clusters, equal to the number of Natural Subregions in Alberta. Sean also coordinated with field crews from fRI Research and UBC to collect data on road conditions and human activity along roads in the Yellowhead study area using a free app. The app can be used on most smartphones and tablet and has provided valuable ground data that is now being combined with high spatial resolution satellite imagery using machine learning algorithms to automatically detect and classify roads. This work will support future analysis to improve our understanding of how roads and road activity affect grizzly behaviour and well-being, and could help to refine policies around road construction and access. Currently, Sean is analyzing how forests recover after different types of disturbance (e.g., fire, harvesting, insect outbreaks) within grizzly bear ranges in western Alberta. Using a 33-year satellite time series and data from over 130 individual bears collected by fRI Research, Sean is assessing how habitat quality is changing over time and what that might mean for forest management in the future.